Named for a defunct corner liquor store with an enormous “K” painted on its side, the true significance of the Big K site in Historic Anacostia lies in the three decrepit but once majestic wood-frame historic homes that sit on contiguous lots adjacent to the Big K itself. 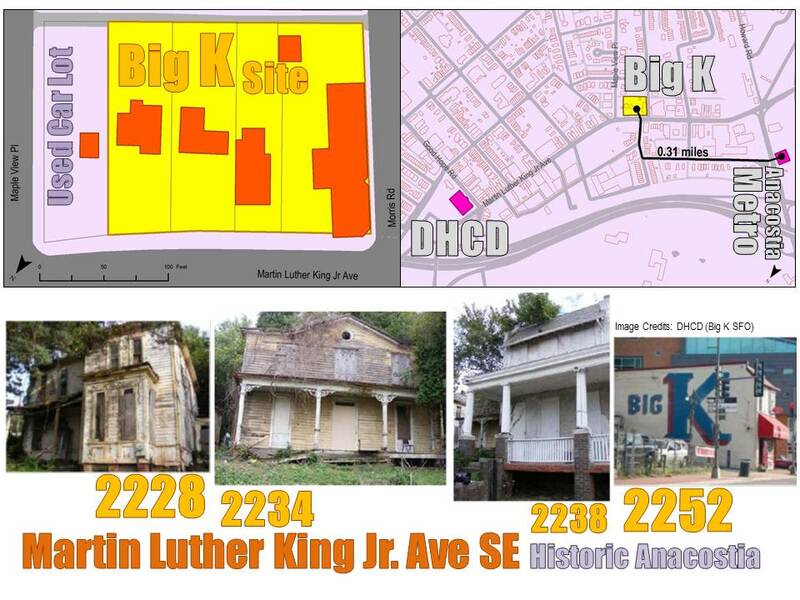 Last week, the DC Department of Housing and Community Development (DHCD) released a Solicitation for Offers for the development of the Big K Site. A Solicitation for Offers (SFO) is essentially the same as a Request for Proposals (RFP), an equally bureaucratic but slightly more familiar term. 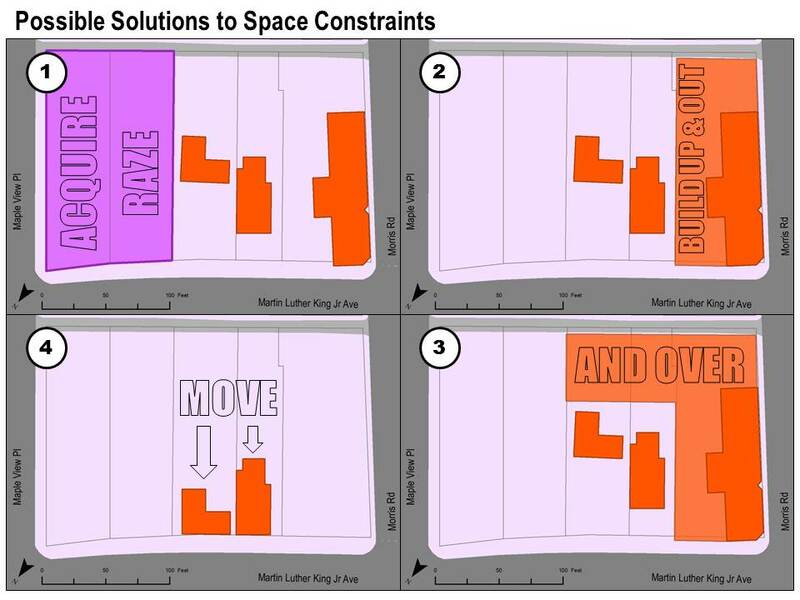 In this case, the desired mix of uses appears to exclude residential. The SFO states specifically that the Advisory Group recommends no housing at all. However, the solicitation also gives weight to the Comprehensive Plan, which values this type of metro-accessible site, located on a commercial corridor, as an opportunity for higher density mixed-use development that does include housing. More importantly, adding households within walking distance of this site will increase the demand for retail goods and services, raising the feasibility of the project’s commercial component. Physically, the site has some constraints, though none are insurmountable. DHCD only owns four of the five properties on the block. The one that it does not control is currently operated as a used car lot. Prospective developers could sweeten their offers by gaining control of the car lot and proposing to pair it with the adjacent lot (2228 MLK) included in the solicitation that contains a historic single family home approved to be razed (Solution 1, below). The Big K liquor store on the corner of Martin Luther King Jr. Ave and Morris Rd (2252 MLK) lies outside of the Historic District, but considering the historic nature of the overall site and the community’s desire for preservation, it may be wise for a developer to save as much of the building as possible. With that said, there is still plenty of room for the structure to grow up and out (Solution 2), and even laterally behind the adjacent homes (Solution 3). The two remaining detached, single family homes (2234 and 2238 MLK) are located smack in the middle of their respective lots and must be preserved. But why not move them up to the lot line (Solution 4)? If the additional density gained justifies the cost, this may be an option worth exploring. Ultimately, what gets built at the Big K will depend on the creativity of the development teams that respond to the solicitation, particularly in their ability to lure commercial tenants and make effective use of the plentiful incentives available at this site. While DHCD does not explicitly offer a subsidy beyond, presumably, selling the property for less than the appraised value, the project may be able to take advantage of Historic Tax Credits, New Markets Tax Credits, and/or Tax Increment Financing. Plus, if a high quality proposal is received and championed by residents of Anacostia, the Mayor and Council may be able to find a way to make it work financially via grants or tax abatement. Here’s to hoping the Big K gets some visionary responses, and why wouldn’t it? Developers, architects, and preservationists should be drooling over the opportunity to be able to say that their project triggered the revitalization of Historic Anacostia.